When asked to lead or pull block Rankin moves well and finds his target. He executes a beautiful cut block when he is on the move. When he got his hands on the defender he rarely fell off his block. He stays with his block and try to keep driving his feet. While Rankin does a good job of engaging and staying with his man he will not be confused with a "road grader" type offensive lineman. He lacks the power and explosiveness at the point of attack to drive his man back. On reach blocks he does have the body control needed to turn his body in order to seal off the defender. Pass protection is where Rankin will have some struggles. 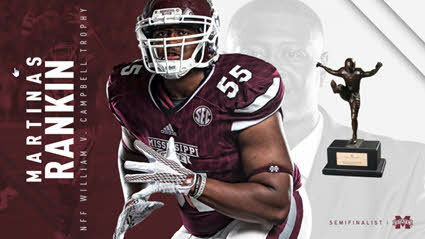 Rankin moves well for a big man but his footwork needs to be improved to play left tackle in the NFL. In his deep pass pro sets he is either back on his heels or flat-footed. This made me assume he will be open to inside moves from speed rushers. Late in the UGA game they turned up the pressure and that is exactly what #17 Davin Bellamy did to him. If not for a tug on the jersey Rankin would have put his QB in some serious pain. This issue appeared in the LSU game as well. He set too far to the outside and he was beat easily on an inside move by #48 Donnie Alexander. 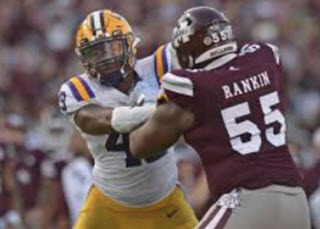 Once he is beat Rankin's footwork will become sloppy and he will turn and chase the defender rather than try to shuffle his feet to try and maintain proper angle on the block. I have seen him get both perpendicular and parallel to the line of scrimmage while in pass protection and it is hard to be effective while in either of those positions. When faced with blitz pressure or defensive line stunts Rankin does very well at recognizing them and communicating to his other linemen. I did not see a time where he missed picking up the incoming blitzer or the tackle coming around on a stunt. Another intangible that Rankin possesses is that he competes on every play. Even when the UGA was out of hand he did not "loaf" on any plays. A trait that I would like Rankin to have more of, but is not necessarily required for playing in the NFL, is having that "edge" when you play. There was never a time where Rankin gave that extra little push after the whistle or got in an opponents face if he thought a teammate was wronged. Like I said I know it is neither a measurable nor a required trait but some teams like to have their "big uglies" play with at least some kind of chip on their shoulder. Despite the negatives listed Rankin does possesses the building blocks for a solid LT in the NFL. Most of Rankin's shortcomings should be able to be improved on or minimized with coaching and conditioning at the next level. However, if his footwork cannot be improved he might find himself on the right side so he does not face as many quick DEs. I have a hunch we might start hearing talks of Rankin being a natural OG.